How can I approve correction requests? 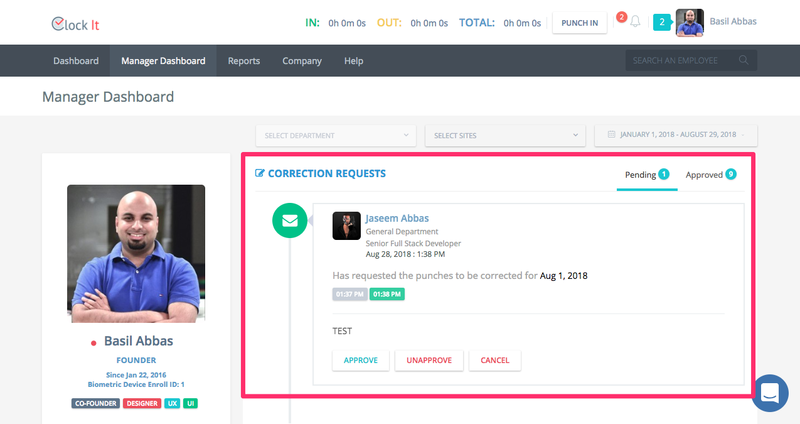 Find out how to approve correction requests that are raised by your team. A correction request is always raised by a user and will be sent for approval to the reporting manager. 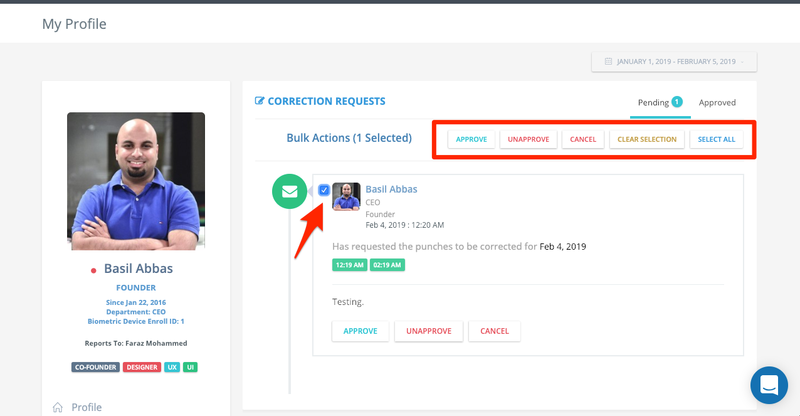 The reporting manager can also raise a correction request on behalf of his/her team and approve it, if he or she has the required permissions. All pending correction requests will show with a bubble notification. 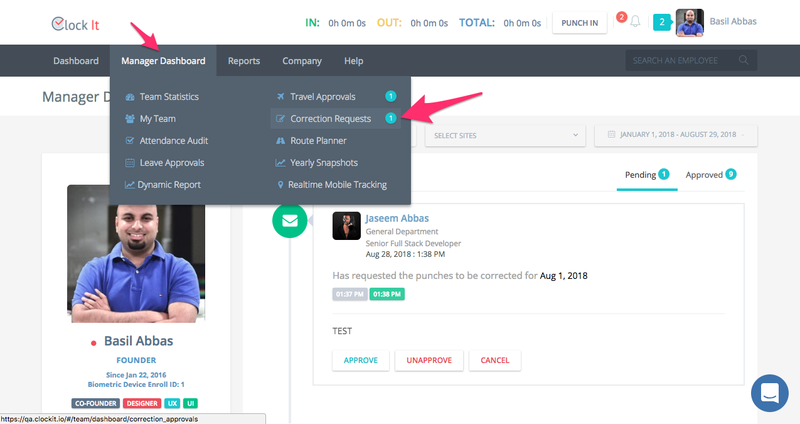 All correction requests raised by your team will appear in the table and you can toggle between the pending and approved correction requests. 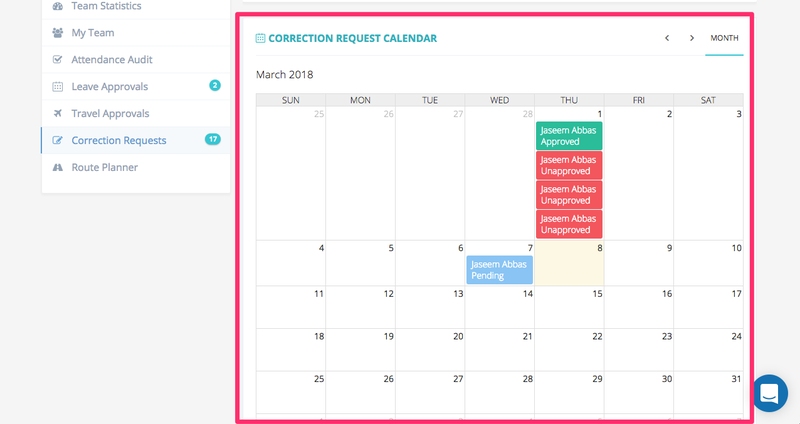 The correction request calendar will also show all the requests that are raised by your team. You can click on the calendar date and get the details of the punch. The corrections are colour coded so that you can easily understand them. NOTE: By unapproving or cancelling a correction request you will restore all the previous corrections to the original state. You can also approve multiple corrections by bulk selecting them. You will need the appropriate permissions to approve, unapprove or cancel. 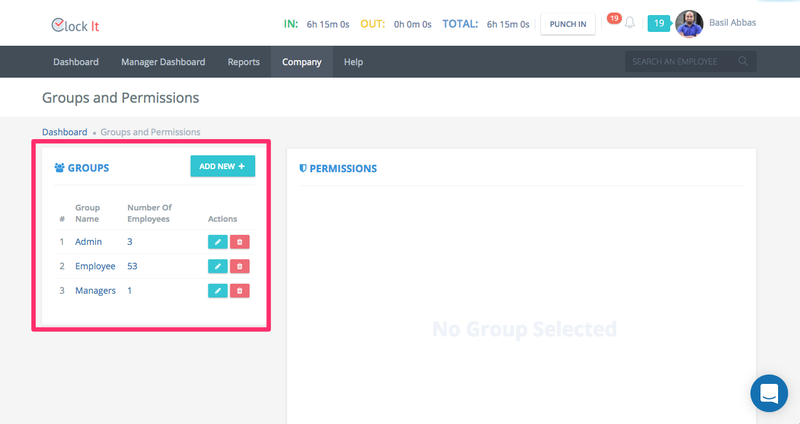 To view the correction request permissions go to Company > Groups and Permissions. Select the group and load the permissions. Look at the Correction Request to view all the types of permissions. This permission is needed for anyone in this group to raise a correction request. Without this permission the pop up to edit the punches will not show for the user. Allow this user to apply for correction request for everyone. This permissions would allow anyone on ClockIt to request a correction request for other users in ClockIt. Depending on the reporting manager set for the user that the correction request is being raised for, the request will be sent for approval. Allow this user to apply for correction request for his/her team. This permissions will allow this user to raise a correction and apply for it. 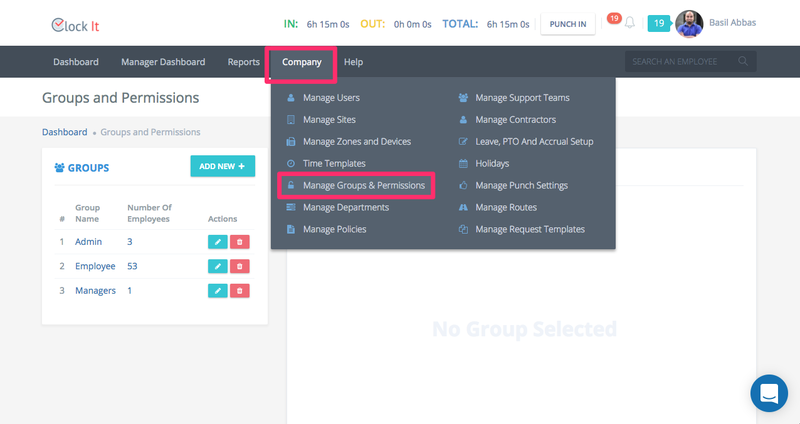 But only the reporting manager can do this and can only be done for his/her team. This permission ensure that everyone in this group will need to have their correction requests approved by their reporting manager. If this user does not have a reporting manager, then the correction request is directly saved. This permissions is used so that the approve and unappove buttons are visible to all users in this group. 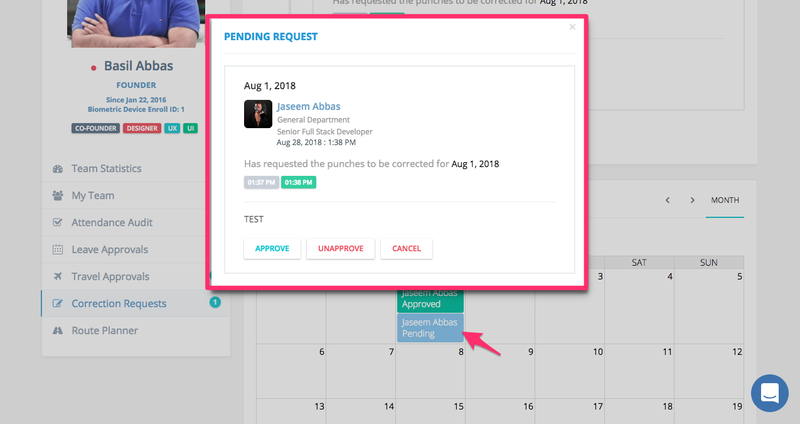 I can approve and un approve requests by going to the user profile of the user or on the correction request calendar. CAUTION: This permission would allow me as an admin to approve/unapprove my own correction requests. Allow this user to approve/unapprove correction requests for his/her team. This permissions is used so that the approve and unappove buttons are visible to only the reporting managers of the user who has raised the correction request. 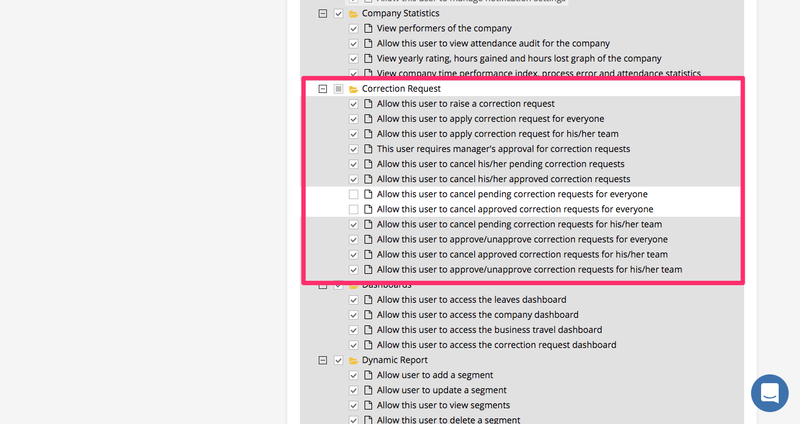 This permission will allow this user to view the Manager Dashboard > Correction Requests. If the same user raises a correction request, then it can only be approved/unapproved by his/her reporting manager.